I selected this next commentary game both based on its excitement factor and it being a Symmetrical English (not two qualities you often see together). A standard imbalanced position follows after Black's (FM Alisa Melekhina) 5...e5, which can lead to a slow maneuvering game. In this case, however, White (Jennifer Yu, also the winner of the previous commentary game) chose to pursue a non-standard and perhaps somewhat risky kingside strategy starting on move 12, rather than focusing on the usual queenside and central play revolving around d5. Melekhina reacted well and picked up the gauntlet by castling on opposite sides, but her apparently safe-looking move 14 became the root of later problems by opening the f-file. Yu then took advantage of her opponent moving her bishops away from protecting key squares not once, but twice, then found some creative tactical resources to win. An excellent and informative struggle between two fine players (although this was not Melekhina's tournament). 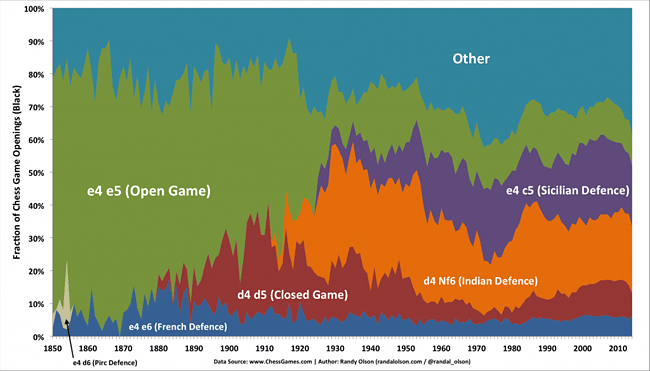 The chess world is full of trends - popular openings (as in the above graphic, credit to Randy Olson / ChessBase), tournament formats (rapid chess is now a thing), and so on. The chess improvement community, as a subset of this, has also been subject to trends - for example, a large part of the original blogosphere was focused on solving series of tactical problems via the Michael de la Maza method. Although I wished them well in that regard, the "seven circles of hell" method of redoing tactical problems always seemed a little hyped and perhaps even suspect. In the end, it almost always led to burnout. This blog was founded in part to keep me honest and committed to chess training, with a big part of that being committed to the idea and practice of analyzing your own games. Although it's a common practice for serious chessplayers, it's not something that has been prominently discussed or even necessarily present in the general consciousness of the chess improvement community. Until more recently, that is. In the past couple of months I've noticed an uptick in references, examples and useful highlights of the benefits of analyzing your games (and having them analyzed by others), more so than in any time since the 2012 post that's linked above. Closely related to that is the idea that looking at others' thoughtful analyses in annotated games can provide unique insight into chess concepts, how an effective thinking process works, and can boost your own understanding significantly. A game of chess is a battle both against your opponent and yourself. You have to make decisions almost every move (apart from very obvious ones including recaptures). The problem is to express yourself while avoiding blunders, though absolutely everybody from Magnus Carlsen down makes these occasionally,and to follow your desires while maintaining sufficient balance to remain within what is reasonable in the position. This sounds both high level and abstract and obviously top players will be able, when on song, to produce games far beyond the level of club players. However, it still applies to club players, who must make decisions based on their understanding. They too must find their way through a maze of possibilities - or if you prefer, peer into the fog. In this column I'd like to dispel some of that fog through analysing readers' games and/or answering specific questions. When working with students I normally start by asking to look at a game they are proud of and one they are not. And ideally I'd like readers to send in one of both - Ecstasy and Agony - though if you'd prefer just the former to be in print that's totally understandable. I can either analyse the whole game or focus on a particular position. With the proliferation of strong chess engines, it's become not only easy to analyse your games with them but hard to resist their use. They provide a merciless commentary on the tactics, which we all often miss, but have only a limited connection to what is actually happening when two human beings do battle across the chess board: and often skew the viewpoint of spectators when watching games online. I therefore propose to analyse readers' games as much as possible without an engine on. What I'm interested in, is identifying the critical decisions and "flow" of the game and neither concept is endemic to the silicon assistance we now employ. The engines are very addictive though so I imagine that I will check with one of our silicon "best enemies" for a second opinion and to error check. I always think it's a miracle when I or anybody else plays a really good game or even avoids significant tactical mistakes. So I'm certainly not intending to be critical of anything that readers are kind and brave enough to send. He's done a great job so far and in Agony Column #12 you can see a hybrid of original analysis and Speelman's commentary, submitted by a fellow blogger at the Hebden Bridge Chess Club. I particularly like how Speelman focuses on practical lessons and insights for improving your game, not blindly following whatever the computer engine says is the best move (one of the pitfalls of computer analysis). The most powerful thing I can leave you with is to do the following: analyze one of your games, but focus on doing the following: aim to find out as many of your mistakes as possible and note them. You might even want to suggest a better move than the one you played. Then do one more thing: try to come up with an understanding of why you made the mistake. Is this something that comes up often in your games? Then extend this further: how can you prevent this mistake in the future? How can you change your thinking to evolve as a player and not make this mistake again? This article at the Chess Improver site, by fellow chess improvement blogger Bryan Castro, helps provide some structure to your self-evaluation process. One thing that I particularly like is that it emphasizes identifying positive examples from your play, along with mistakes; reinforcing the positives is something that I think can easily be overlooked in the process. We need to recognize our mistakes but not punish ourselves too severely, which is just counterproductive; look towards the future and understand how to avoid falling into the same traps, that's a better approach. On the flip side, we need to identify our best practices and learn how to repeat our successes in the future, without becoming overconfident. One of the more entertaining forums for showing improving players' games and analysis are the periodic articles by IM Jeremy Silman on Chess.com. The recent "If the Board Says ATTACK, Then ATTACK!" is an excellent example of how to gain insights by looking at a game both conceptually and concretely, while having some fun. Silman is sometimes panned for being too harsh in his comments, but I find it refreshing to see the attitude that chess is a game that should not be taken too seriously (by non-professionals at least) and that a sense of humor over our play is a good thing in the long run. It's hard to find a better advertisement for analyzing your own games than the above-linked blog, especially the recent series on his most memorable games. Game #5 particularly stood out to me, since the "never give up" theme I think is terribly important for practical play - many times I've despaired but still put effort into finding the best move, and have been rewarded for it. Dana's analysis and his solicitation of commentary is something to be emulated.